Just outside the breakfast room window at my sweet friend Nancy’s house…. ….and down a few steps…. 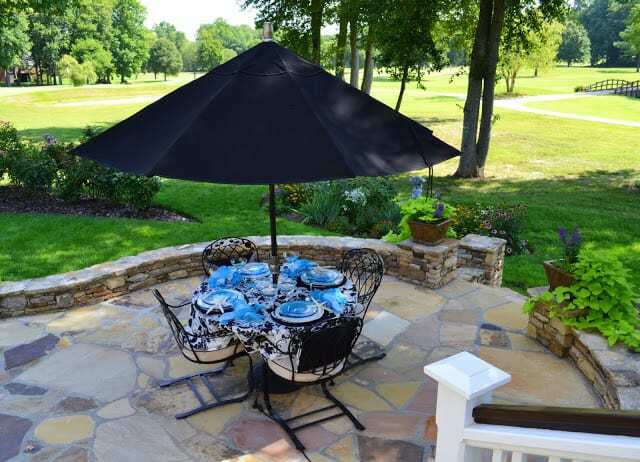 ….is a lovely table on a flagstone patio overlooking a golfcourse. I wasn’t on a golf course anymore. I was immediately whisked away to a tropical paradise where turquoise water and white sand abound. Turquoise, black and white are one of my favorite color combos. The translucent blue stemware reminds me of clear, cool, refreshing water. Look closer and you’ll little fishies merrily swimming around the candle votives. 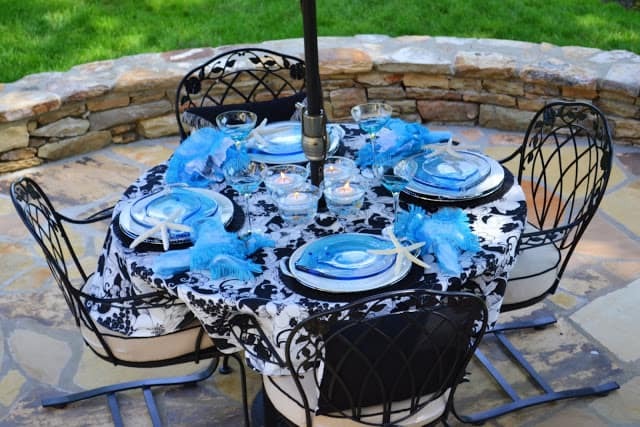 The sheer turquoise napkins paired with solid white napkins that are trimmed with rickrack are perfect. This last shot is looking back toward Nancy’s brand new deck. I’ll be taking you for a tour of it next week. You’re gonna fall over! 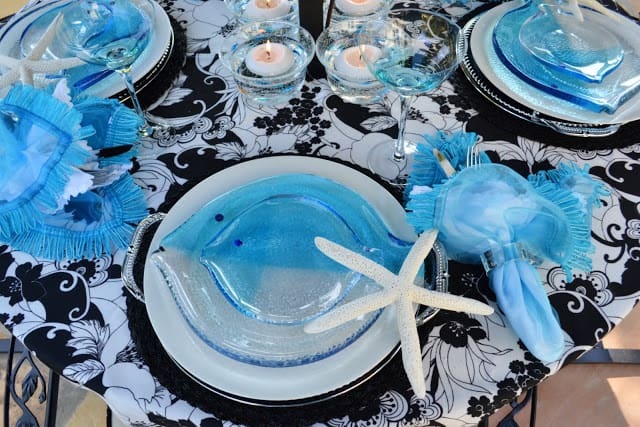 Thank you, Nancy for allowing me to feature your Fishy Tablescape! Love those fishy dishes! Looking forward to the tour! This is so nice. 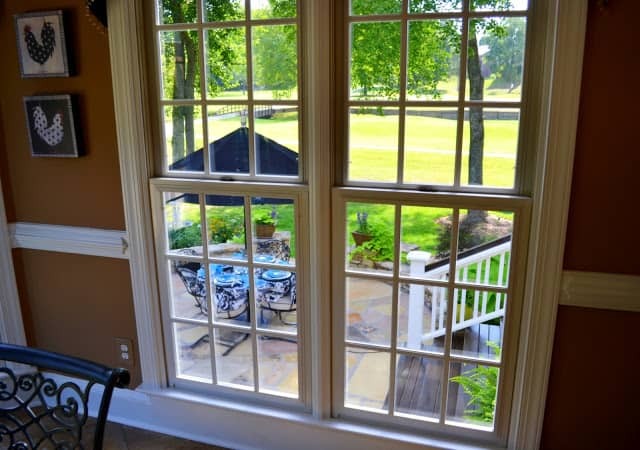 I want her outside patio and view. I would sit out there every morning with my coffee. Love the table settings. The entire scene looks so serene. 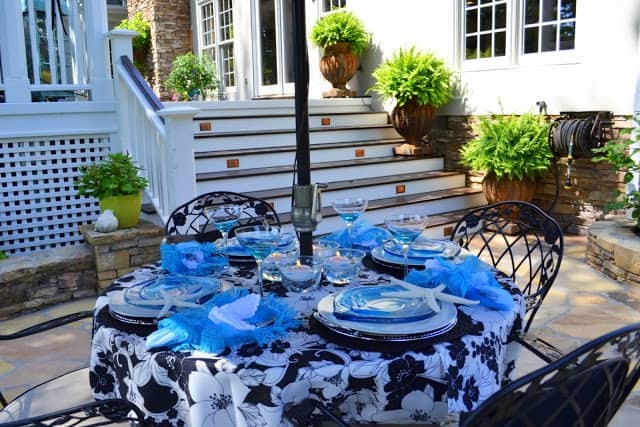 Suzy…you know how much I love tablescapes and this one is beautiful…love the colors!…Her view is wonderful and I look forward to the patio reveal!!! What a beautiful table. Can’t wait to see the deck. I am late getting here cuz Bob requires a lot of attention during the day.LOL! I love Nancy’s table but I an sure you put it together. What a great friend you are. Love those fish dishes. Could I have another obsession starting up here. I especially love the sheer napkins. I have been wanting to add those to my stash. Your table is absolutely beautiul! I’ve never seen dishes like thoses, they look so cool and watery, perfect for a warm summwer day. Just looking at them lowers your temperature. I found your lovely blog through mutual follwers and I love it. I am now following . . . please come over, I would be delighted if you would choose to follow me back. I’d love to eat dinner in that spot, so beautiful! 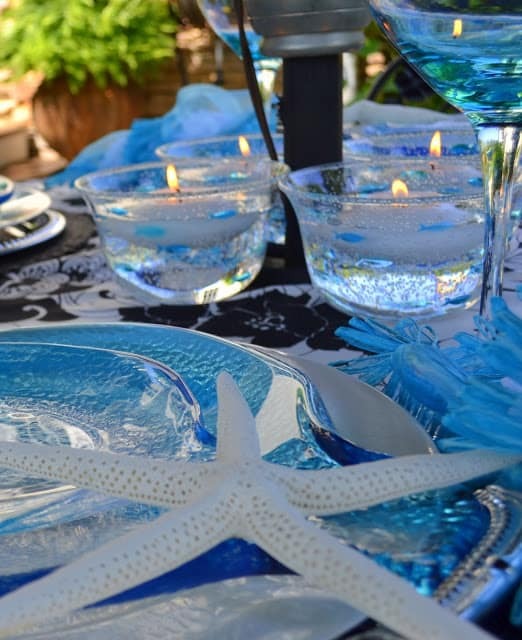 Beautiful fish plates and the starfish are perfect. Love the colors in the table. Wow what a tropical paradise! I love the fish dishes! I have not wanted to cut a hole in my tablecloths for my outdoor table but I am going to now! So pretty! Come link up to Centerpiece Wednesday and share this with us. Suzy, this is so pretty! Every single detail is just wonderful! OMG this is beautiful! I can’t help but stray and notice the flagstone patio and the beautiful curved wall! The table is gorgeous! 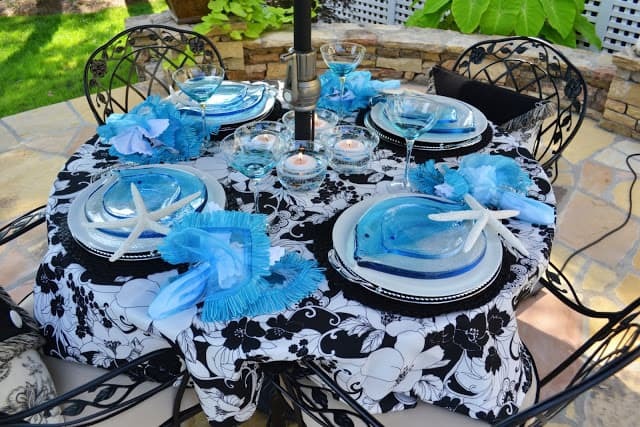 I love those glass fish plates and the votives with the fish- the stemware and the napkins! The black and white really set up the blue coloring so nicely! Such a pretty view from the window! 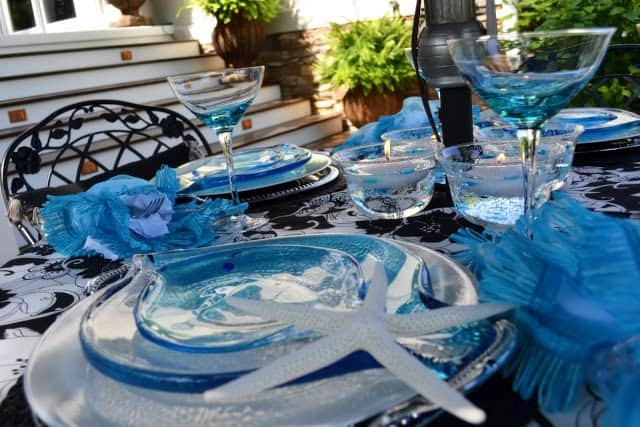 The table is so elegant, with a touch of whimsey with those gorgeous blue glass fish plates. I love your friend’s patio. What a great place for a summer meal. Delightful. I have too many dishes but now I want some fishy ones too. 😀 Thanks for the link up. This looks like a fun party ahead. Thank you for sharing it with us! 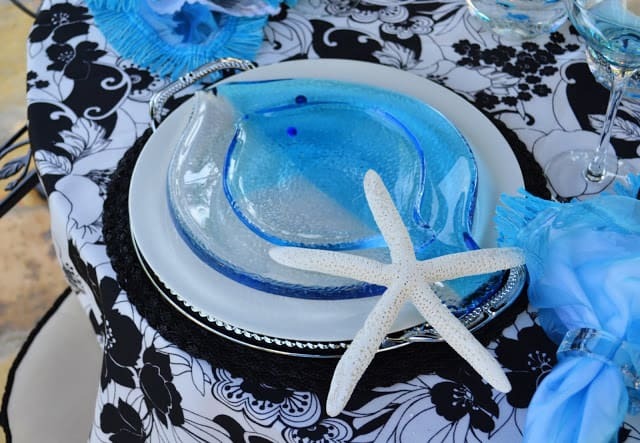 I absolutely adore the glass fish dishes! They make the whole table feel cool, calm and most of all fun. Who could help but have a wonderful meal in this beautiful space. 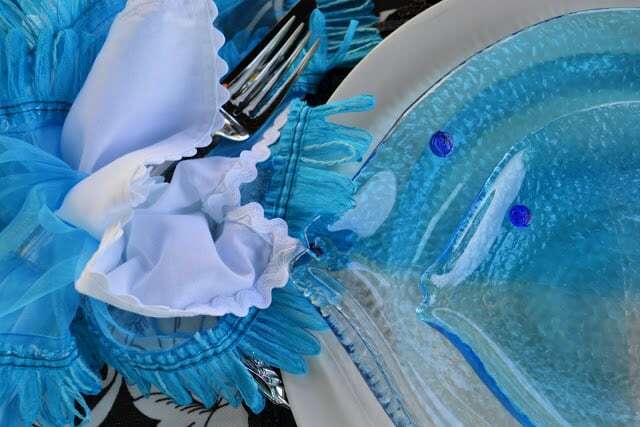 Suzy, I thoroughly enjoyed this post of Nancy’s fishy tablescape. Love the black accents including the market umbrella. The fish plates are calling my name. Really, it’s gorgeous and arranged beautifully, too!